Maa Biraja her grace and benevolence shines like the sun on the horizons of Odisha. Maa Biraja the ruling deity of Jajpur and by all means the most ancient Goddess of the Hindu pantheon is adored and worshipped not only as Adi Shakti but also as the most important deity of the Tantracult. The image of the Maa Biraja is the representation of two armed Mahismardini image. The image is worshipped inside her magnificent temple at Jajpur that has been estimated to have been built at around 11th-12th Century AD. The image almost 70ft in height rises from the floor level but nothing except for Her face is visible as Her entire body is garbed in clothes, ornaments and flowers.Thus Biraja is the deity of religious assimilation, a deity that signifies unity of all diverse faith. 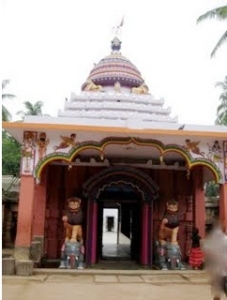 It is thus hardly surprising to see her temple dotted with Gods from Vaishanvites as well as the Shaivaite cults. Truly She is glorified as the “Adimata – The Ancient Mother” and was by far the most important deity of ancient Odisha.